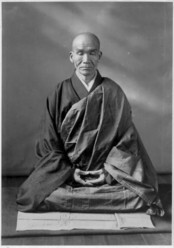 When you enter a zazen hall, it is not just to practice zazen - you also have to keep to the rules of the hall. First, go to your seat and bow toward your cushion, turn around and bow the opposite direction, then place your behind on the zafu, taking care not to use more than half of it. Don't sit on the full cushion. 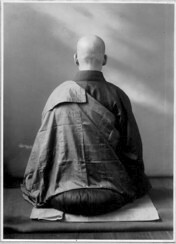 Your zafu is just as important for your zazen as is the sword for a samurai. It is important that it has the right size and height for your body. Now place your right foot high up on your left thigh, then place the left foot high up on the right thigh. Your knees should rest firmly on the mat, just like shells that attach themselves to a rock in the ocean. Next, place your right hand on your left foot, palm facing upwards. Then put the palm of the left hand on top of the right hand, with thumb tips touching each other. 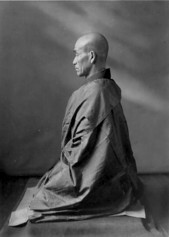 After that, sway your body left and right, making first big movements that gradually become smaller, until after seven or eight movements you settle firmly in the zazen posture. Take one deep breath and relax your shoulders completely. Push your lower back forward. Resting on your hip bone, your spine should be straight and unmoving. Stretch your neck as if you tried to pierce with your skull through the ceiling. Draw back the chin. Sitting like this, your nose should be straight above your navel, and your ears straight above the shoulders. Put the tongue against the roof of the mouth, while the back teeth sit on each other. Keep the eyes slightly open and cast them down on the tatami 3 to 4 feet in front of you. Take care not to pull the inner organs upward. That doesn't mean though that you should exert any force down in your lower belly. The inner organs should rest naturally in the body. If you are too hard on your organs, you'll become sick. Breathe naturally. If you have difficulties to breathe, this caused by an unreasonable strain. Make sure that your hips are always bend forward and your consciousness sharp and clear. 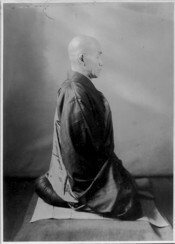 Don't forget that the vital point of zazen lies in the hip/waist/pelvis area. You should always be alert. Don't make a sleepy face - or you'll look like a ball of cotton wool! Pull back the chin and make a lively face.